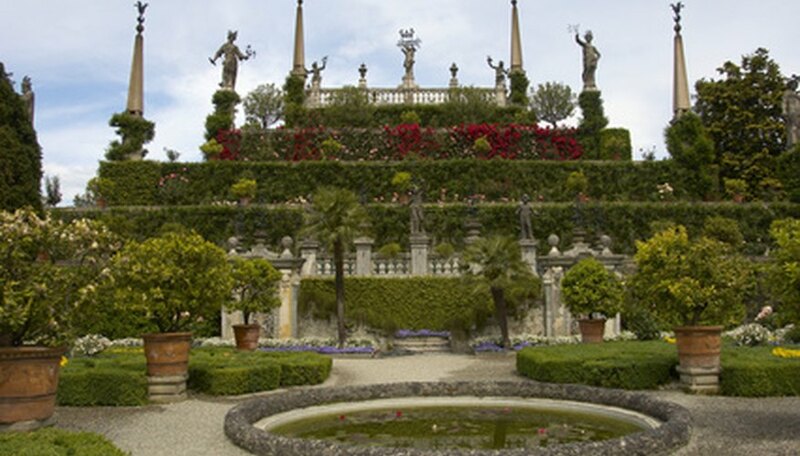 Countless species of evergreen shrubs exist, including broadleaf shrubs, needle-leaved shrubs, or conifers. To identify a broadleaf evergreen shrub, you’ll need to study the shrub’s leaf arrangement, color and other identifying characteristics, as well as any flowers and fruits. When you’re attempting to identify needle-leaf evergreen shrubs, however, you’ll need to focus on the leaf formation to make the proper identification. A plant field guidebook purchased from your local agricultural extension service can be a great reference for identifying native evergreen shrubs. Identify broadleaf evergreen shrubs by their fruits. Most holly shrubs have bright red berries, while the Sarococca confusa has black berries. Mexican orange shrubs produce citrus-like small fruits that are inedible. Determine the broadleaf evergreen shrub’s species by inspecting its flowers. 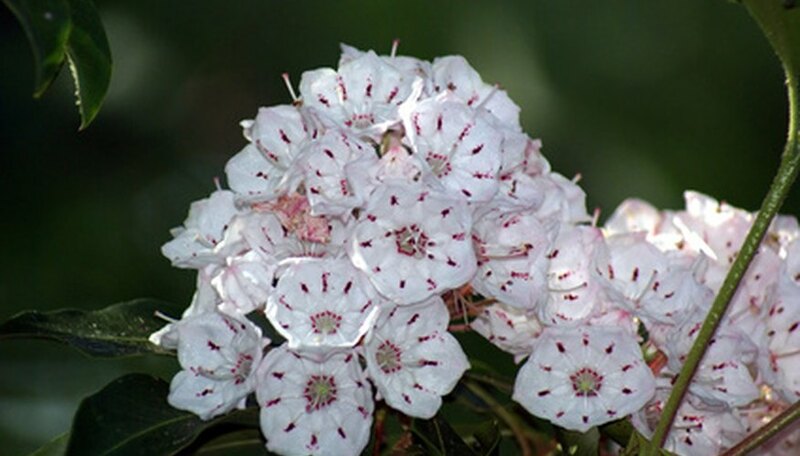 Mountain laurel produces pale pink, open blooms, while the Japanese Pieris has bell-shaped, clustered flowers that are white or dark red. 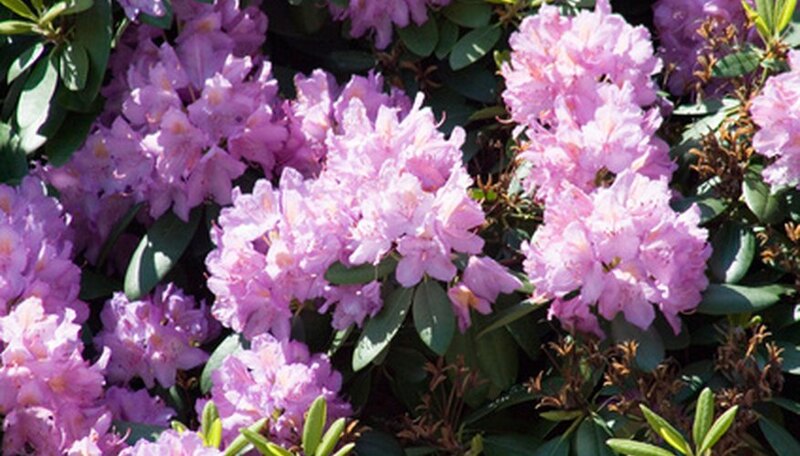 Rhododendrons and azaleas are also common flowering evergreen shrubs, blooming in a wide range of colors depending on the specific species. Decipher the evergreen shrub’s identity by studying its leaf arrangement. 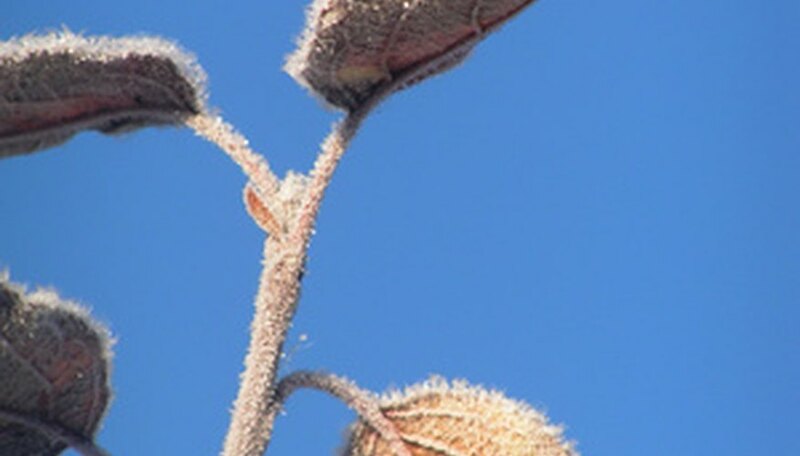 Notice whether the leaves are arranged opposite, meaning the leaves grow directly across from each other in pairs, or alternate, meaning the leaves grow in an alternating arrangement on the stem. 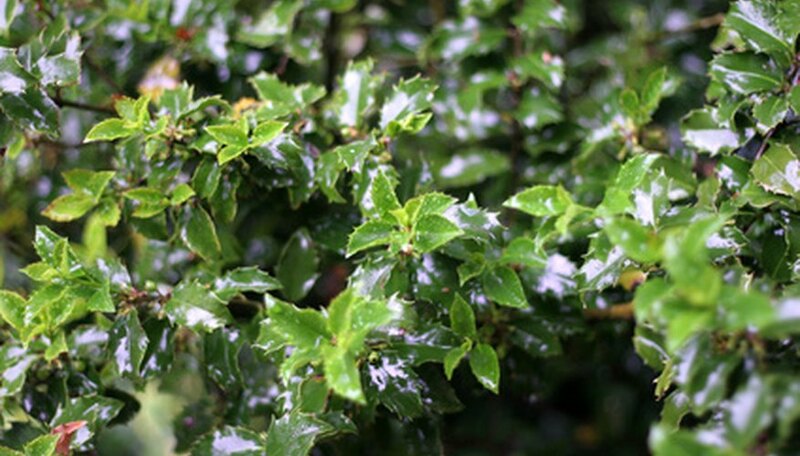 Study the leaves on the evergreen shrub to determine whether they’re compound or simple. Compound leaves have multiple “leaflets” growing from a single main stem attached to the branch, while simple leaves are attached directly to the main branch. Identify the evergreen shrub by its leaf color, if the shrub doesn’t have standard green foliage. Korean boxwoods have leaves that turn bronze in autumn; Golden Scottish Heather has golden leaves that turn a vibrant orange in winter; and the Golden Gem Japanese holly shrubs has golden-yellow leaves. Identify evergreen shrubs with “awl-like" needle leaves, which have numerous alternate “branchlets” that emerge from a single stem. 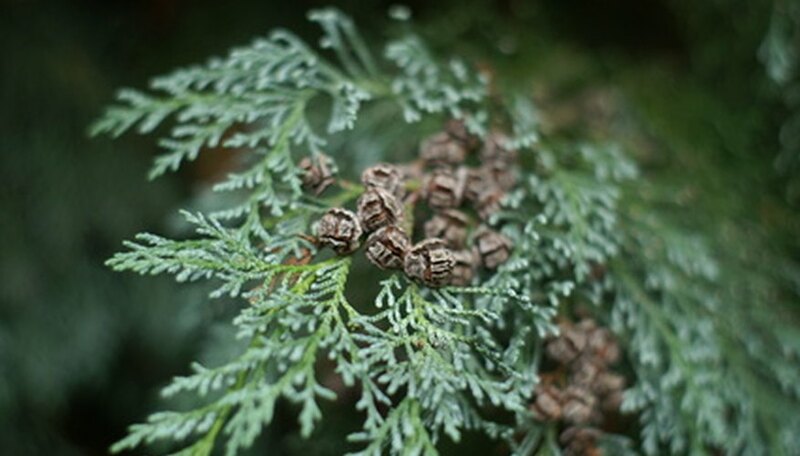 Junipers and Siberian cypress are common evergreen shrubs with awl-like needle leaves. Spot evergreen shrubs with “scale-like" needle leaves, which have fan-like, often flattened branchlets that sprout from a single stem. 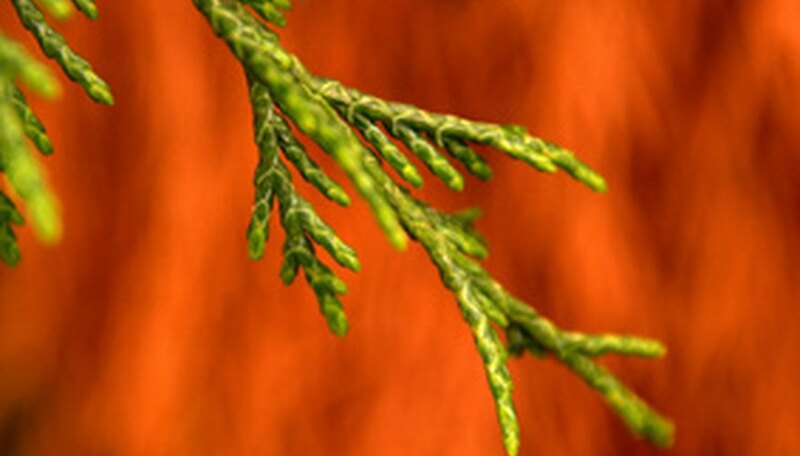 Arborvitae and Hinoki cypress, or false cypress, are the most common evergreen shrubs with scale-like leaves. Identify evergreen shrubs with needle-like leaves by looking for sharp needle clusters that are typical of common pine trees. 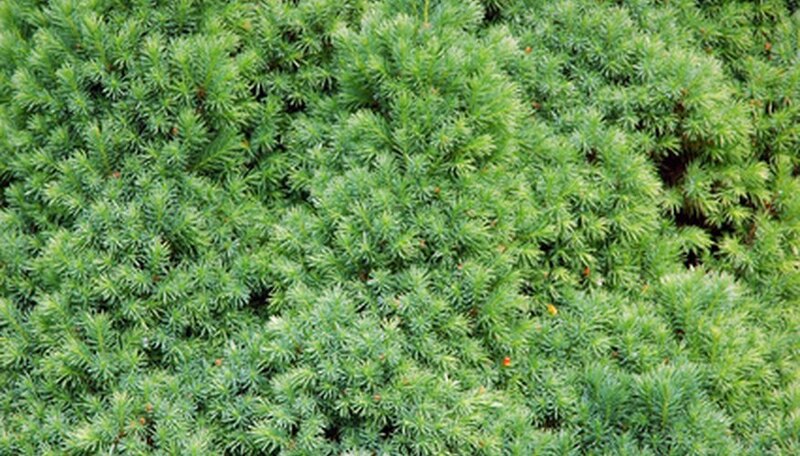 Yews, firs and spruce shrubs are all evergreens with needle-like leaves. Common evergreen shrubs with oppositely arranged, simple leaves are boxwoods and Chinese privets. The evergreen huckleberry, rhododendron, sweet gallberry and dog hobble have alternate simple leaves. Mountain laurels, evergreen sumac shrubs and Mexican orange shrubs have compound leaves. Don't confuse evergreen shrubs that have palmately compound leaves with those that have simple leaves. Palmately compound leaves have leaflets that grow and fan out from a single point on the stem, instead of growing spaced along the stem, which can make a palmately compound leaf's leaflets look like a single simple leaf.